Ekadasi, a day specially dedicated for ourselves, to get rid of our sinful life and to become the part of the creator ultimately. It is very propitious for Hindus. They commemorate this day for the compassion of Lord Vishnu showered upon his creatures. Among 24 Ekadasis, Vrishchika Ekadasi is the most important and more widely celebrated. Guruvayoor Ekadasi is as famous as Thrissur Pooram. Pilgrims to Guruvayoor is like a river normally but during Ekadasi it will be an ocean and temple is filled with krishnasthuthikal. A month before Ekadasi, there starts an Ekadasi Vilakku, which is offered by any persons, families or organizations. People believe that the offering of ghee to this Vilakku too proffers them a blessing. Temple opens on this day for Nirmalya darshan will close only after Dasami and Ekadasi days which allowing the devotees a continuous darshan. Offering of a token amount called Dwadasi Panam is an existing custom which continues for the welfare of all. Guruvayoor Kesavan is synonymous to Guruvayoor temple, which remains in everyone’s heart as a nostalgic feel. Gajarajan (Elephant King) is the unique title given by Guruvayoor Devaswom to Kesavan. 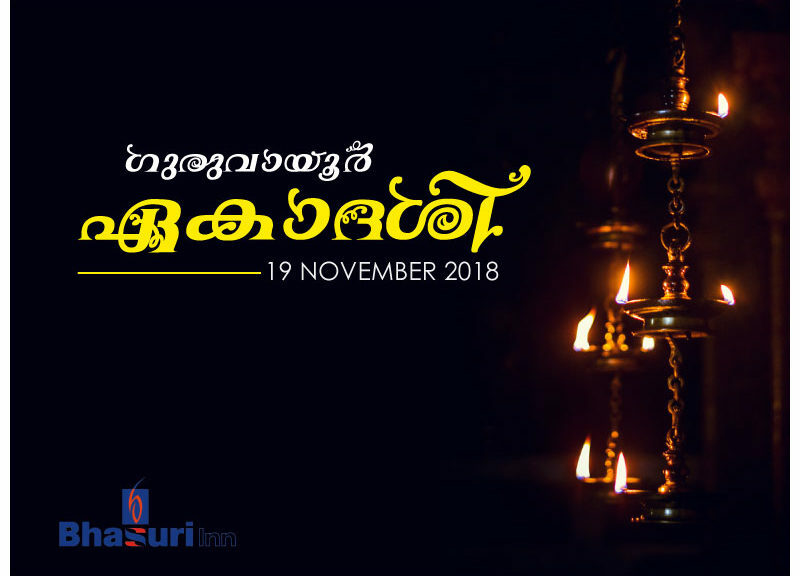 Memorial tribute is given to Guruvayoor Gajarajan Kesavan on this Ekadasi day, which witnessed the same lost on the same day in the year of 1976. Chief of elephants garlands the statue of Guruvayoor Kesavan on this day to express the immeasurable love. Ekadasi, a holy moment for every devotee, is observed as a fasting day. It should follow in a spiritual atmosphere with hymns to lord is the only source of their energy. Place where they stay should be sacred in all means. Bhasuri inn, one of the best hotels in Guruvayoor, is ready to welcome this Ekadasi in its full divinity. They provide not just rooms but space where the pilgrims can stay in a peaceful and calm frame of mind. Land of Guruvayoor is dedicated for the devotees who visited this holy place and the residents themselves ready to serve the pilgrims as a commitment to their life which begins and flows through the hymns arise from this house of prayer. Bhasuri inn, which provides best rooms in Guruvayoor, offers finest facilities to the pilgrims from all over the world. Their multi cuisine restaurant shows a best example for their immense hospitality and impartial love to all devotees. Guruvayoor temple and its surroundings are permeated with holy chants. Bhasuri inn which is located near to temple, assure a spiritual environment to make the devotee a feel of serene scene which is rarely but surely found in Guruvayoor. They promise the devotees a calm, divine and heavenly abode. The temple town of Kerala, Guruvayoor, is majorly occupied by many hotels. Bhasuri inn is a unique option in the list of rooms in Guruvayoor. It is distinctive in its location and the facilities provided by them to the devotees. Served with love in the background of sacred intention is the key to the successful acceptance of Bhasuri inn as one of the best hotels in Guruvayoor.